Oregon currently has a record low unemployment rate, with good data going back to 1976. It’s true that this likely overstates the strength in the economy, however we know the labor market is tight and Oregon is at or near full employment. I think we’re close but not there yet, however you can make a reasonable argument we are. What is not true are those claiming the unemployment rate is low because it only counts those receiving unemployment insurance benefits. This is clearly a zombie idea — something that should die in the face of all evidence and data, but somehow manages to stumble forward forever. The claim is made in good times and in bad, but is equally misguided. When the unemployment rate began declining following the Great Recession, the claim was used to say that it only reflected individuals who exhausted their benefits and gave up looking. While this certainly applied to some individuals, the return of job growth was the key driver in those initial unemployment rate declines. So why is it a zombie idea? The unemployment rate comes from the household survey, where they ask if individuals have a job, and if not, whether they have looked for one recently. If you say you do not have a job but are looking, you count as unemployed. Whether or not you receive unemployment insurance benefits is not a deciding factor here at all. That said, those who receive benefits are generally unemployed, but not all unemployed receive benefits. You can see this in the chart below. 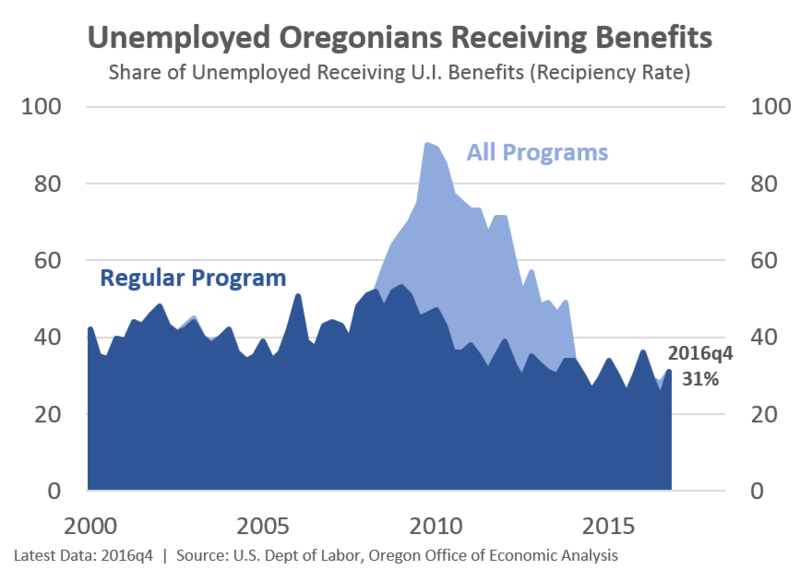 Over the past 3-4 years, when it comes to unemployed Oregonians, the number of new entrants into the labor market looking for work has been equal in size to the number of Oregonians who have lost their jobs but want another one. Now, it is always true that the longer you remain unemployed, the lower the probability of finding a job. In fact, the long-term unemployed are more likely to give up looking for work then to find a job. However that relationship is getting better in a stronger economy as the job finding rates are picking up. Note that the chart below is based on U.S. data. 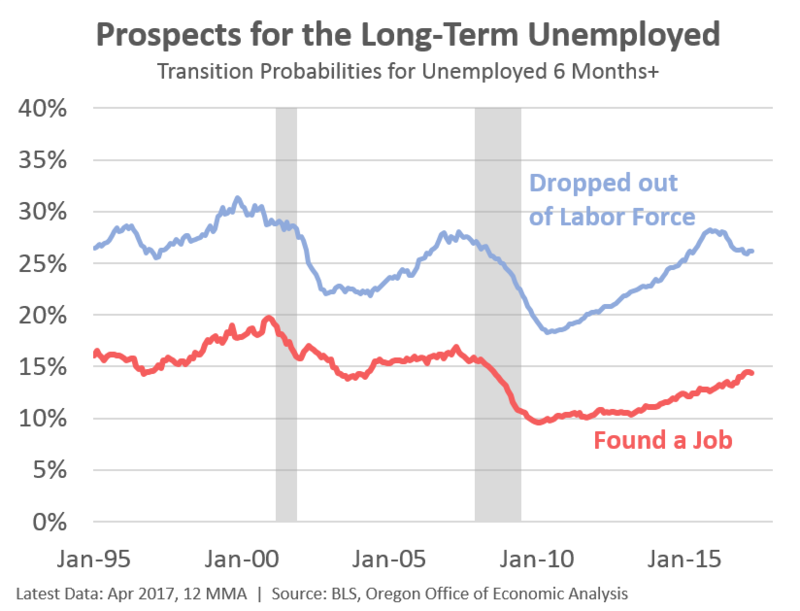 This pattern, where longer-term unemployed are more likely to give up looking is a huge concern and the longer and deeper a recession, the higher the possibility or probability of permanent damage. The fact that the U.S. economy has been operating below full capacity for much of the past 17 years is a big deal and likely has resulted in some permanently lower labor force participation rates. The best way to test whether or not this is true, is to run a strong economy. In a tight labor market, firms not only must compete on price (wage) to attract and retain the best workers, they also have to cast a wider net when looking to fill positions. Right now, the Oregon labor market is tight. Firms are generally no longer flooded with job candidates with sparkling resumes. The state’s Employment-to-Population ratio for all prime-age cohorts is back to where it was in 2007. As such, the vast majority of people who want a job, have a job, hence the low unemployment rate. In casting that wider net, employers are hiring individuals who were previously long-term unemployed, have an incomplete skill set that requires more on-the-job training, and the like. Overall these are very good dynamics to see in the economy. But they generally only happen at or near full employment. As long as we are defining terms (and attempting to put zombies in their final resting place) it might be helpful for me to show this item from the U.S. Department of Labor’s Bureau of Labor Statistics glossary. One important distinction is that in order for a person to be considered unemployed he or she must have made specific efforts to find employment during a specific period. I’d be interested in getting a better understanding of the makeup of those who have dropped out of the workforce. Someone 65+ who can opt for retirement I understand. Ditto someone who is disabled or in school, but for the able bodied 24-65 cohort, who are they and how do they manage without employment? Receiving some form of aid? Family support? Working spouse/partner? Hi Scott. Thanks for the questions. I’ll direct you to previous work we have done. First, this looks at changes from 2000 to 2013 in terms of why folks aren’t in the labor force.